Premium restaurant-style croutons, generously seasoned and made from fresh, oven baked bread, toasted to a golden brown. Fresh Gourmet Garden Herb Premium Croutons brings the aromatic flavor of the garden to your salads and side dishes. Seasoned with a savory blend of herbs and spices, these croutons also make a fantastic stuffing. Healthy eating is a snap with Fresh Gourmet Premium Croutons! At Fresh Gourmet, we bring good taste to your table – every day. Fresh Gourmet is the number one brand of croutons and salad toppings sold in the world. 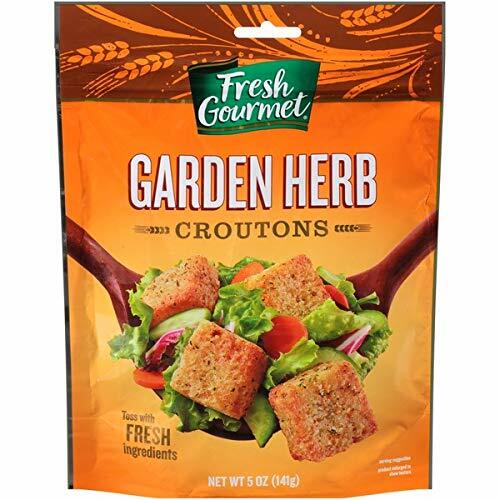 Long known for the innovative approach that inspired the original produce crouton, the Fresh Gourmet brand offers the largest variety of salad toppings available on the market today. As salad toppings experts, Fresh Gourmet sets the pace with today`s trends, offering busy cooks the crunch, flavor and texture that transform everyday dishes into memorable meals in minutes. For nearly 30 years, Fresh Gourmet continues to be the one brand you turn to for the Crunch You Crave! View More In Salad Toppings. Chatham Village Cheese and Garlic Crouton, 5 Ounce - 12 per case.